Jakarta, July 17th, 2012 – Aston International and PT. Nusa Pratama Property celebrated the ground breaking of Jakarta’s largest and most important hotel development to date, the Aston Priority Simatupang Hotel & Conference Center. The Aston Priority Simatupang Hotel & Conference Center was conceptualized to support southernmost of South Jakarta’s development by providing international standard accommodations and conference facilities to the city’s growing industry and commerce. The future Aston will features 321 oversized guest rooms and suites and a wide range of facilities befitting of an international hotel including a specialty restaurant, a coffee shop, lounge, a swimming pool, several meeting rooms and a grand ballroom for up to 600 persons. TB Simatupang is the sub district of South Jakarta, located in the southernmost part of South Jakarta and close to Jakarta – Bintaro toll outer ring road. With its strategic location, the Aston Priority Simatupang will fill a large gap in the market for quality accommodation and professional meeting facilities in the developing district of South Jakarta (Cilandak and Arteri Simatupang area). “We believe Aston Priority Simatupang will add our portfolio as another exciting development in Jakarta. With 6 hotels now operated and another 6 will open within this year in Kemang, Pluit, Pasar Baru, Tendean, Melawai and Serpong, it makes us the fastest growing hotels network in Indonesia ” commented Norbert Vas, Aston’s Vice President of Sales & Marketing. Snapshot Ground Breaking Aston Priority Simatupang Hotel & Conference Center, seen in the image (left to right) Mr. Moh Fariz Firdaus – Director of PT. Nusa Pratama Property, Mr. Andy Arslan D – Chief Commissioner of PT. Nusa Pratama Property, Mr. Jules Brookfield – Director of Technology PT. Aston International, Mr. H. M. Anas Efendi SHMM – Mayor of South Jakarta, Mr. Kadafi Yahya – Chief Director of PT. Nusa Pratama Property and Mr. Mahdi Hidayatullah – Commissioner of PT. Nusa Pratama Property. 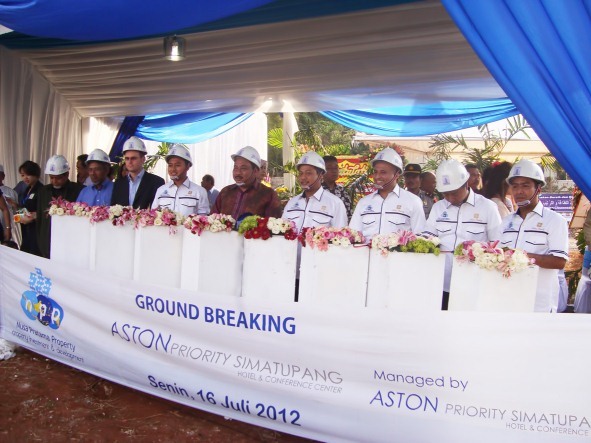 Snapshot Ground Breaking Aston Priority Simatupang Hotel & Conference Center, seen in the image sirens button’s pressing by Mr. H. M. Anas Efendi SHMM – Mayor of South Jakarta together with the managements of PT. Nusa Pratama Property and PT. 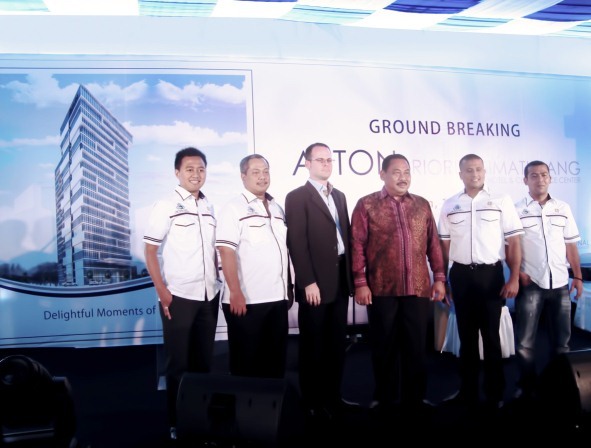 Aston International as an official sign of Aston Priority Simatupang Hotel and Conference Center’s development. Aston International entered Southeast Asia over a decade ago and has since become a prominent international player in the Indonesian hotel market, with offices in Bali, Jakarta and Surabaya. Archipelago properties currently operate in Indonesia, Malaysia and the Philippines under the five-star Grand Aston and Crimson, deluxe villa Royal Kamuela and Kamuela, four-star Aston, three star Aston City, Quest and Neo , boutique budget class Neo hotels and select service favehotel labels.